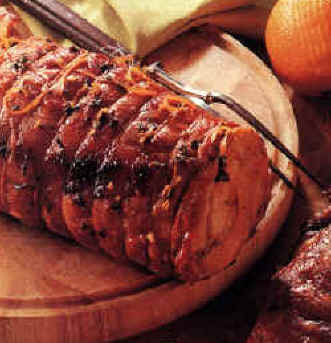 This is a quick version of the Italian classic porchetta which encompasses a whole hog boned and wrapped together and roasted to create something magnificent. The quality of pork is of the utmost importance as it would be in Italy. We will then rub it down with aromatics and dump some delicious beer over it to marinate for about 6 hours prior to oven roasting it. To me this dish is always something very special. It is to signify a great event and if nothing else reminds us of just how great the home grown pig is. So I decided to go with a Allagash Curieux. This beer is incredible and aged in Jim Beam barrels for 8 weeks. It takes on some interesting coconut and vanilla notes. 1. Begin by rinsing your pork loin under cold water. Rest it into a nice large roasting pan or two smaller pans depending on what is available to you. From there dump your beers over the meat. Rub the rest of the goodies all over the loin. 2. Place the meat back into the fridge and allow to marinate for 4-6 hours. Do your very best to finish off the rest of the beer you have used. While you wait you can pre heat the oven to 375 degrees. 3. Once you can no longer stand it remove the pork from the fridge and season liberally with salt and pepper. It will be a thing of beauty now. Tuck it away in the oven for about 1 hour and a half or a thermometer reads 160. 4. Pull her out and rest the meat for about 15 minutes. Stare at it, snap a few photos because once you cut into it it will go fast and you will have a hard time ever believing it actually existed.